Former Missouri Sen. Claire McCaskill is pictured after an October interview at KCUR. Ocasio-Cortez beat a high-ranking member of House Democratic leadership in her district’s primary in August, and since taking office has been a major Twitter presence and called President Trump a racist on national TV. McCaskill said Friday that her larger point was that progressives like Ocasio-Cortez need to have patience with Democrats from more moderate areas. McCaskill also said that a lack of compromise in Washington will lead to more gridlock and more cynicism from voters. Democrats need a presidential candidate who is inspirational and “speaks to the future as opposed to the past,” McCaskill said. She added that fundraising will be a factor — and not just when it comes to big donors. As for the candidates themselves, she said politicians like Massachusetts Sen. Elizabeth Warren, New York Sen. Kirsten Gillibrand and California Sen. Kamala Harris all have positive attributes, but could stumble in appealing to suburban and exurban voters in the Midwest because they are from blue states. 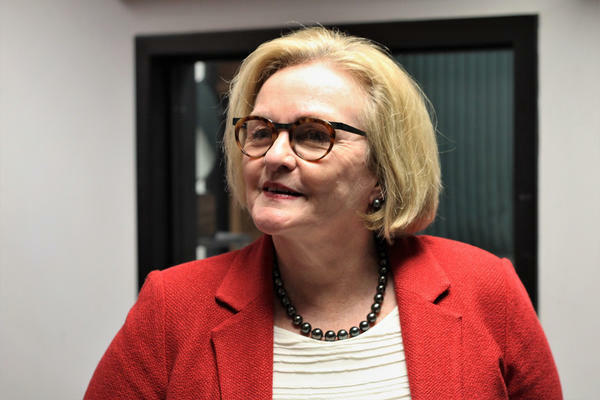 McCaskill said she was pleased with the fundraising and support she garnered in her bid for a third term, noting she did better than any other Democrat had ever done in a midterm election in Missouri. But she said three factors helped Republicans close any enthusiasm gap, thus electing current U.S. Sen. Josh Hawley. “It was the optics of the caravan (of Central American migrants), it was the optics of the (Brett) Kavanaugh confirmation and it was the camping out of Donald Trump in our state," she said. "And those three things got all of the reddest parts of our state off the couch and they turned out in record numbers. McCaskill said she’s now working to help the Democratic party in her home state.